Add this stylish women's Gothic red wig to our vampire bat and Gothic bride costumes for a detailed Halloween costume. 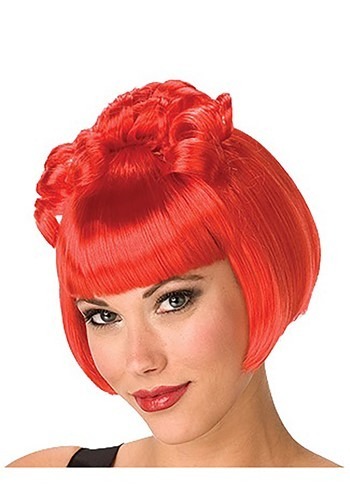 The vibrant red wig features a short bob with widow peak bangs and curls on the top (please note the bangs are cut at an angle and vary from the picture). The hair is made from synthetic fibers for a realistic appearance. 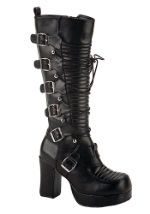 The interior has a mesh cap for a comfortable fit and is also lined with elastic to secure the wig in place. 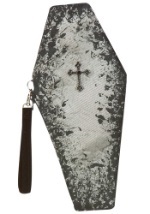 Add a coffin purse and dead flower bouquet from our costumes accessories for an unforgettable scary Halloween costume.